She is named Jones, so she must be from Wales. Bryn Terfel's real name is Jones, too. He once said in an interview that if you walk into a pub in Wales and shout out, "Mr. Jones," all the men will turn around. This is perfect. You can see that her German training, from Zurich, is excellent. My own live experiences of her were never quite as wonderful as this. "Abscheulicher! Wo eilst du hin?" from Fidelio, Beethoven's tribute to married love. These are ten excellent singers who didn't make the list of 14 for one reason or another. In the previous list all, with the exception of Cecilia, emphasize opera over all other styles of performance. 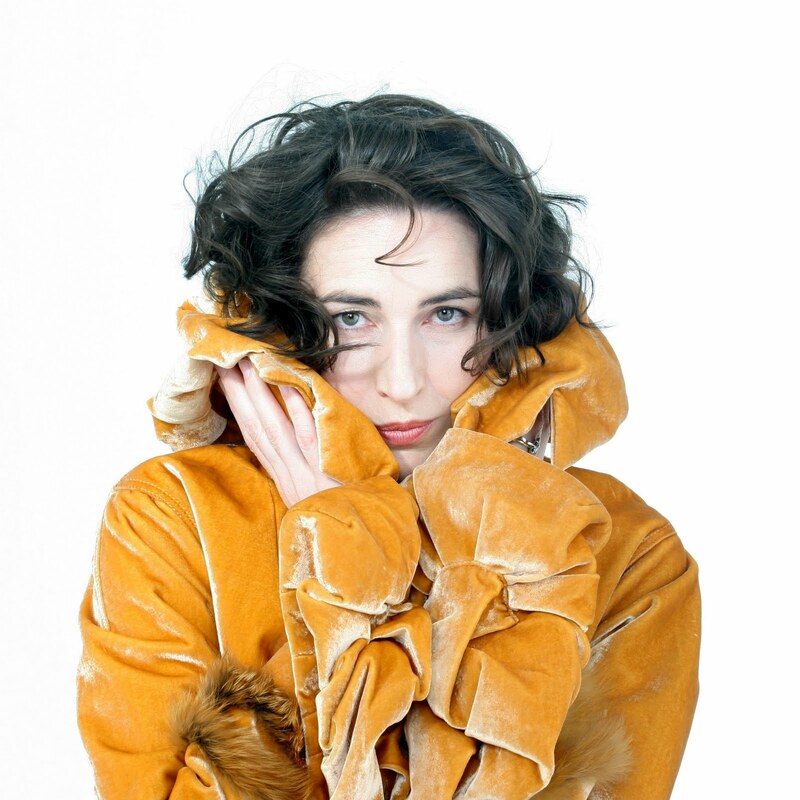 Cecilia has invented an entirely different style of career from anyone we've seen before. She pretty much does whatever she wants and attracts audiences by virtue of her powerful musical personality. It was appropriate that Limelight chose her face for the cover. 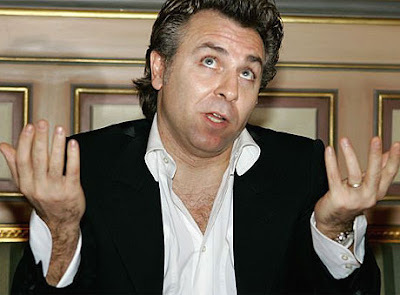 Roberto Alagna is really strictly an opera singer and never ventures out into other repertoire (this means other classical repertoire). He is that rare thing, a French tenor very much immersed in the Italian style. 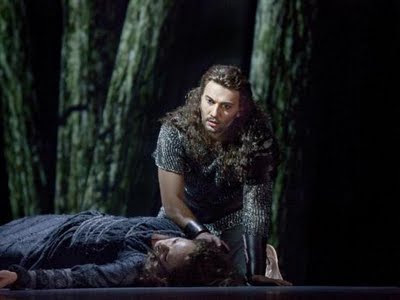 His career is enjoying a resurgence because he appears to be exactly what Peter Gelb is looking for as his leading man for French operas such as Carmen and Romeo et Juliette. He looks good in closeups but falls out of the top group because he occasionally sings out of tune. It is hard to understand why the tenor Marcello Giordani isn't more famous. After all, he is a true Italian tenor. We've seen him in Simon Boccanegra, Turandot, La damnation de Faust and Ernani where he has brought us fine performances, but our heart has not skipped any beats. His voice and his style are first class, but he misses only the divine inspiration. Perhaps he should try the Bjoerling trick where he pretends to be about to lose it, adding the element of danger. I'm quite fond of the dramatic soprano Maria Guleghina who is famous for performing the impossible roles of Turandot, Abigaille, and Lady Macbeth. Someone has to do it, and she manages this extremely heavy repertoire without showing any vocal stress. For me she delivers where others fail, but her style of heavy soprano is not in favor now. The coloratura mezzo Vivica Genaux is gorgeous and charming, has wonderful technique, looks good on the stage, but has no madness. If one simply is not mad, where is one to find it? 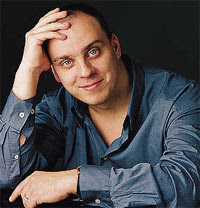 Matthias Goerne is a marvelous German baritone who has made his name in Lieder. If he wishes to rise any further, he would need to excel in some opera repertoire. I fall in and out of love with him. Perhaps this is as far as he will rise. Susan Graham is wonderful but similarly lacking in madness. Véronique Gens is a French soprano of the very French lyrical sort. This can absolutely not be viewed as a criticism, but French singers are always at a disadvantage. Lyric soprano Christine Schaefer is not lacking in madness. I will make the wild guess that she is exactly where she wishes to be, admired for her creativity and musicianship and not for her ability to seem just like everyone else. She has the most wide ranging career of any singer active today. Baritone Erwin Schrott is continuing to rise. It is too soon to predict how far he will go. Dramatic soprano Nina Stemme has only just begun her rise. Her Walküre Brünnhilde was marvelous, and there is no reason she will not become the outstanding Wagnerian of her generation. She approaches Wagner from a new direction, a direction for our times, and will make him her own. There are probably a lot of people who could go into a list like this, people whom we love to hear, but do not love quite enough. I am currently reading Judi Dench's memoir And Furthermore. She advises that the way to learn to speak Shakespeare properly is to listen to John Gielgud and Frank Sinatra. "Sinatra presents you the entire arc. He never lingers too long on one thing. You appreciate the essence of the whole. You're led through a song with Sinatra. There's a beginning, a middle and end." She sang Sally Bowles in Cabaret. For my money she was the best singer in the movie Nine. She sings the title music "This is a Fine Romance" in the TV series A Fine Romance. I promise to love Sondheim if he's always done with Judi. Compliment: Judi tells of rehearsing A Little Night Music with Stephen Sondheim watching. Afterward she asked him for a note--a suggestion or criticism. He replied, "It's yours now." Here is another interview with Jonas Kaufmann. He's everywhere. New York, London, Munich, Paris, Rome. My order: London, Rome, New York, Paris, Munich. It was the biggest season ever for HD. I count 11 operas. Can that be right? They were: Rheingold, Boris Godunov, Don Pasquale, Don Carlo, La Fanciulla del West, Nixon in China, Iphigénie en Tauride, Lucia di Lammermoor, Le Comte Ory, Capriccio, Il Trovatore, and Die Walküre. The Metropolitan Opera is still the place for Verdi with magnificent performances of both Don Carlo and Il Trovatore. It helps to make up for the terrible Simon Boccanegra last season. Also in the masterpiece category was René Pape's Boris Godunov. I am also happy that Susan Graham's Iphigénie en Tauride is preserved for posterity. Just about everything else falls into the enjoyable if not exactly masterpieces category. And that is the problem, isn't it? We are always on the verge of catastrophe. I predicted the other day that before the end of the run someone would be killed. It wouldn't take much. The performers are all distracted by the lurking machine, though less so in Die Walküre. I understand that when asked about the machine, Jonas Kaufmann replied that he liked the acoustic. It is a giant reflective surface that can benefit the singer's effect in the house. I guess that's a good thing. I'm supposed to be rating the simulcasts. Rheingold came closest to bombing. I made it to the rerun of Il Trovatore in HD last night, and it turned out to be a rerun of Il Trovatore in San Francisco in 2009. The sets and costumes and even some of the cast were the same, except this was the first cast instead of the stand-ins. I agree with Renée Fleming, the hostess--to assemble such a cast is an event. There was quite a bit of excellent information in the interviews. All the performers liked the rotating set by Charles Edwards because it allowed the action to flow without stopping for set changes. All the interviewees agreed that their character is crazy. The plot was explained by Dolora Zajick. Azucena tries to get Manrico to kill di Luna to avenge her mother's death, and when he won't, she arranges for di Luna to kill Manrico. This makes her happy. I see it now. Opera plots are so sick. Each singer was more wonderful than the last. Sondra Radvanovsky just gets better and better. 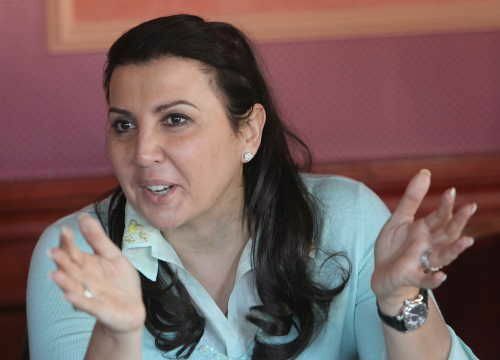 Zajick owns her role. Marcelo is the most insane troubadour I've ever seen. But my award has to go to the incredible singing of Dmitri Hvorostovsky. It doesn't get better than this. I recommend this website called bachtrack if, like me, you enjoy attending musical performances in other cities around the world. I wrote a review for them here of the Metropolitan Opera performance of Ariadne auf Naxos that I attended last week. At this time I don't know if anything will come of this. I blog for fun and often like to say outrageous things. I don't know if this is compatible with writing for other people. It cramps my style. I have reached an age where if things sound different, it could always be my ears. That wouldn't make them sound louder, would it? I never feel an overwhelming desire to see 10 performances of a run of an opera. After all, after 40 times of the same Vogelhaendler, what would be the point? But different productions in different houses with different conductors and different singers can be instructive. After two times of Iphigénie en Tauride with Patrick Summers and Susan Graham (SFO and the Met) I was curious to see the version at the Washington National Opera with William Lacey conducting and Patricia Racette as Iphigénie. This production was amusing bordering on silly. 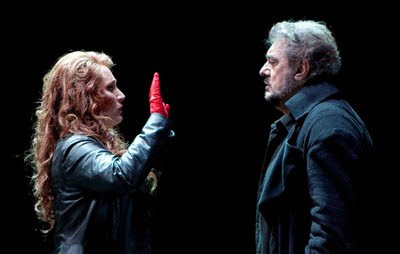 There were metal rungs on either side of the stage, and every now and then someone would climb them for no reason--including Patricia and Placido Domingo as Oreste. Domingo was lively and strong compared to his Met appearance. There was a ballet ensemble consisting of two couples and a man wearing springy legs like you see at the special Olympics. Both the men and the women danced en pointe, a curious sight. Most of the action was inexplicable. At one point the two Greeks enter, lie down on the floor, and have their heads massaged by two of the priestesses. But the English have their own unique perspective, and the English conductor William Lacey wants lighter, quicker, more lively tempos resulting in a shorter, more exciting opera. 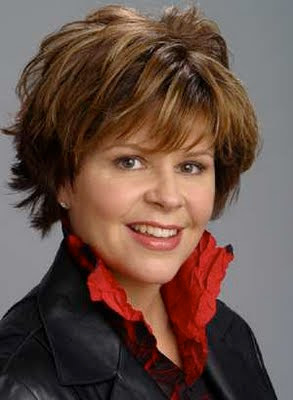 Patricia Racette's voice is edgier, louder, more intensely dramatic. Between them they entirely altered what you are experiencing. One more thing: I have been here before, but I don't remember the singers sounding so loud. Usually how loud they sound varies from one singer to another. Not last night. Amplification? One of the joys of live opera comes from comparing the different perspectives many productions of the same work can bring to great works of art? 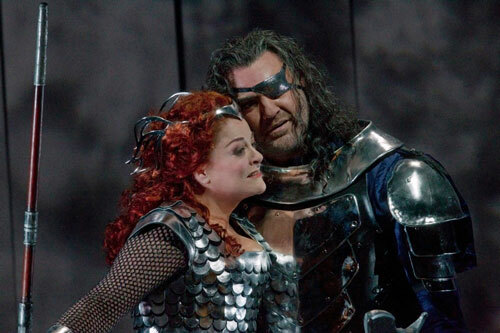 Die Walküre last night at the Metropolitan Opera is more your old fashioned Wagner. Working from story boards can lead you to see the work as a series of pictures. 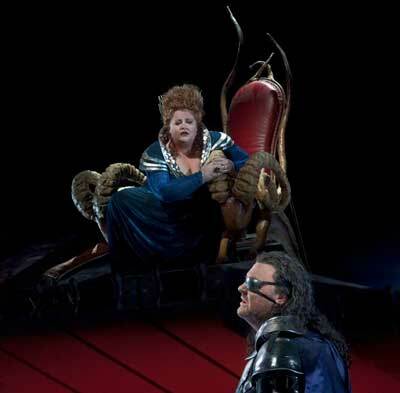 Deborah Voigt in particular was the perfect image of Brünnhilde. The log machine creates pictures which I begin to think look better in the house than on the big screen. In act 1, though, everyone was cut off at the knees. I especially liked the forest in act 2. Or maybe it was just Eva-Maria Westbroek and Jonas Kaufmann as the fated twins I liked. They were a great pair, even looking a bit alike, and acting with style. I wish they had set a standard for the whole opera. There were no cute moving set bits in their scenes, and nothing to trip over, which may have helped. Jonas was perfect--warm, romantic, gorgeous. I feel smug telling what an astounding Siegmund he turned out to be. In the house his singing sounded full and perfect for the tessitura of Siegmund. Sigh. This is the first time I have believed the hype for Stephanie Blythe. In the role of Fricka her voice achieves the highest standards for a Wagner mezzo. This time her contract said not only no wire walking, but no walking at all. She sits in a chair, and all movement is by the machine. The Hunding of Hans-Peter König was also outstanding. Deborah Voigt looked wonderful, and the brightness of her voice cut easily through the orchestra. She flubbed the first high note. I wouldn't want to have to walk out on stage and throw off a high C first thing. No thank you. Bryn Terfel. Let's just say he livened up a whole lot from Das Rheingold. He also lost his Veronika Lake hairdo. I liked him a lot more this time. 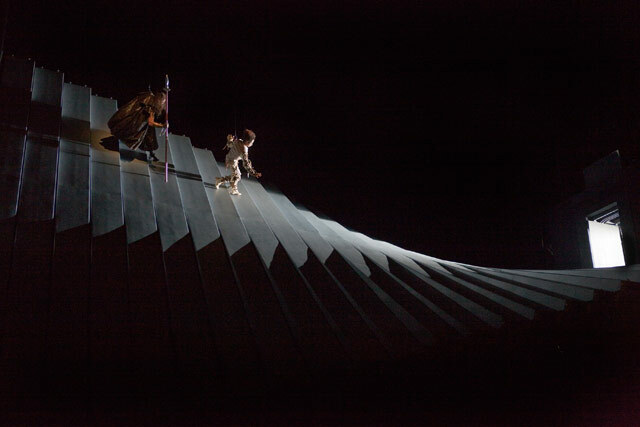 The staging of Wotan putting Brünnhilde on her rock was ridiculous. The drama is in the characters, and it is a great loss to sacrifice that to pretty, sometimes absurd pictures. The biggest ovation was for James Levine. Every appearance these days seems like a miracle. I remember when we took his smiling face for granted. I recently attended a meeting between the manager and board president of the Sacramento Opera and their donors. Many of my questions were answered, especially data about income from recent operas. It was a surprise to me that Elixir of Love and Tosca had lost money. It was not a surprise that they lost catastrophically on Orlando. Yes, I've heard of it. I'd even seen it before. But you surely can't decide things based on that. Their proposed solution focused on money. They propose to consolidate management facilities and some functions with the Sacramento Philharmonic. I see no problem here, as long as the two organizations remain conceptually separate. There were complaints about the performance venue. They must pay union stage hands and rent lighting equipment, since the space doesn't have any of its own. There doesn't seem to be any alternative if they want to stay in Sacramento. There was talk of remixing the finances from 60% tickets and 40% donations to over 50% donations. They are also asking the donors to take over the publicity function. Someone suggested hiring a professional publicist, but that was rejected. What was glaringly missing from this conversation was any discussion of the product. There was talk about cheapening the product, cutting out sets and costumes, paying the singers less money, putting them up in cheaper hotels, but not one thing was said about how to make the Sacramento Opera more desirable for its customers. They were basically telling their donors that if they wanted opera in Sacramento, they had to put out, but there was no suggestion they would be happy with what they got for their money. It was all very peculiar and discouraging. None of this gave me the warm and fuzzies. This is translated from Frankfurter Neue Presse. Some artists like the New Yorkers. Some like the audience in the world city very much. And some love them. Jonas Kaufmann is one of this last group. The young German is currently singing at the Metropolitan Opera the role of Siegmund in Richard Wagner's "Walküre" - and is celebrating a wild success. "The Met is the Eldorado of every singer. All students dream of it - and now it's true," says the 41-year-old. As a child he listened to broadcasts from the legendary opera in New York City on the radio, now the pieces are broadcast worldwide in theaters - with Kaufmann. He is proud to be there: "The Met has always had a special call And it has this rightfully worldwide." Kaufmann is not unknown at the Met. In 2006 he had his debut in "La Traviata", and last year he helped the newly staged "Tosca" to success that had previously failed with the public. "We simply changed it a little bit and had a lot of fun with it. But we had no idea whether this would reach the audience." It caught on: The second attempt was the premiere we have been waiting for, wrote the New York Times - and Kaufmann had left his footprint. Now he is the star. While on the posters for "Walküre" is seen the world-class Welsh tenor [uh, bass-baritone] Bryn Terfel, who is known at the Met for 17 years. But the better reviews go to the German: "The audience fell in love with Mr. Kaufmann," wrote The Times after the sweeping premiere of the five-hour piece. "Good-looking and brooding, he embodies all the heroism and self-doubt of the uprooted demigod. His dark, structured and powerful voice has the ideal German color for this music." He was a true tenor, says the New York Times: "He had a great evening." This is Wagner in the city whose music scene is coined/shaped by Jewish artists, supervisors, donors and opera visitors, far from easy. Kurt Masur with the Philharmonic next door in Avery Fisher Hall already had to listen to criticism when he wanted to play Bach's St. Matthew Passion. Then in the middle of April he played “Les Préludes" by Franz Liszt - once the theme song of the Nazi week-show [Wochenschau] - said a Jewish concert visitor, Liszt was ok: "But I would never go to Wagner. Because he was really a Nazi." "I have often dealt with this issue," says Kaufmann. "But you should be able to separate the work from the composer." About Wagner in New York he has never experienced any animosity. "But you can feel again what it means to be born in Germany and to bear this responsibility. With the generation that lived through the horror, however, I have every understanding." Kaufmann's appointment calendar is full, even for the 2016/2017 season he already has commitments. Sometimes it is not easy for him and his wife, the mezzo-soprano Margarete Joswig, to have time for the three children. Life at home is sometimes determined by the intra-family democracy: "In the choice of music, we are sometimes overruled," Kaufmann says, sighing, "There will be ever Lady Gaga from the family Radio".